I have been working on a workbook that contains Macro for hiding columns with Modano active. I understand that Modano has password protection to prevent unwanted changes in the formula and formats but this has caused my code to break every time I re-open the workbook. Is there any way to get around this without releasing the workbook? Attached is a screenshot of the error that I got every time I run the code right after I open the workbook. You need to use the Modano VBA API to safely manipulate content within sheets containing module components, including hiding and unhiding rows and columns. You cannot simply use normal VBA as this will cause the Modano meta data to diverge from the Excel file objects (e.g. Modano won't know you've hidden columns if you hide then using VBA without the Modano API) and ultimately corrupt your modular workbooks. Upgrade to at least version 10.4.4.0 if Modano (see www.modano.com/software/updates). Download the latest version of the Modano API (using this download link: http://www.modano.com/api/latest). Open your modular workbook in Excel. Open the Modano API in Excel and follow the instructions within its sheet to import the Modano API VBA code into your modular workbook. 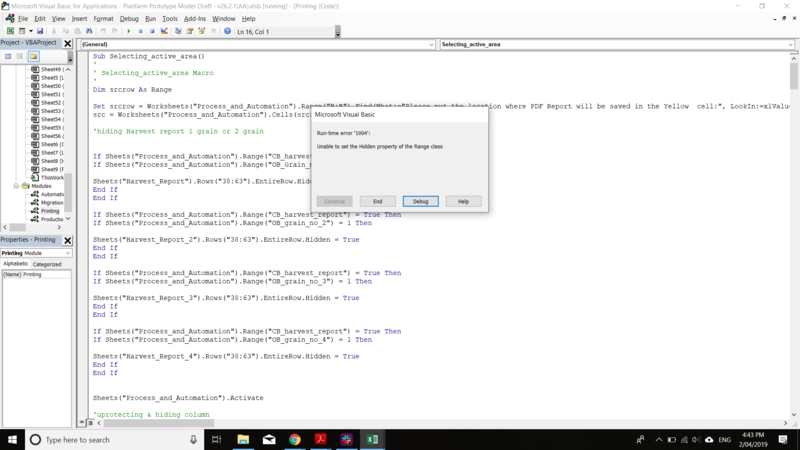 You can import some or all of the example modules but I usually just copy and paste code from the Modano API modules that I need. As long as you import all the API classes (which the import tool will do) you'll be ok.
Add API-based code to your VBA routines to hide/unhide columns. 'Demonstrates the automated hiding/unhiding of columns. I'm aware this all seems very complicated but it's actually very easy to import the Modano API classes and do all sorts of things to module content. I'd recommend playing with the example macros throughout the modules in the API and getting your head around it, after which it should all become much clearer. If you're still struggling I'd recommend buying a support credit via the Support section of your Modano account (www.modano.com/account/support) and one of the Modano team can walk you through it.